My post in May titled “Are Bike Kitchens Elitist by Choice?” got several comments including a concern about privileged people providing bikes to people they see as different from themselves. This concern was not part of my original post, but it is a major hot button for me. So I was glad to see this reader make the leap, which has inspired this post. Do an internet search for bike charities and you will find pages of links to programs that claim to provide bicycles to people who otherwise could never buy their own bike. I grimace just at the list! 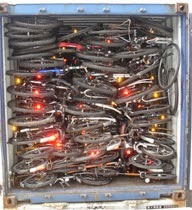 Many send used bikes into developing countries to be given away free. Others invite “the needy” to come to their door and ask for a bicycle handout. First I have to say that charity is a good thing. No matter how much I criticize charity-based programs, the human tendency toward helping others is something we all must be proud of. There are times when any of us can fall into so much trouble that the only way out is to accept a helping hand. Problems arise when this kindness morphs into believing we are better than those we serve. Once this separation occurs in a bicycle program, its leaders will make small, but important decisions that begin to do harm rather than good. Developing countries see the worst of this harm as massive nonprofits fight each other for charity funding that often ends up in the hands of warlords and corrupt dealers. These organizations are so caught in meeting promised goals, they miss the bigger picture—the local businesses that shut down when charity goods flood the market, the disgrace they pile onto communities and whole countries by publishing only photos of people suffering, and the ravenous consumption of funding just to continue the charade. I recommend two books that do a good job of revealing this horrendous state of charity. One is Dead Aid by Dambisa Moyo, an economist from Zambia. The other is The Crisis Caravan by Linda Polman, a journalist from the Netherlands who lays out countless abominations caused by charity nonprofits. It would be easy to look at these offenses as detached from bike charity programs. But we can’t ignore the flooding of free bicycles into developing countries. We also cannot ignore the undertone of disgrace when those who receive a free bike are treated as incapable of purchasing a bicycle like anyone else. I understand that many of the people who are in need of a bicycle are in terrible situations and may be seeking a helping hand. These charity offenses would not be occurring if this were not the case. The challenge comes in seeing each of these people as our equal, looking them in the eye and asking how they would like to take part in the program. Make them feel welcome and valued. Show them that their expertise in surviving their hardships can help the program better serve their neighbors. When addressed with respect like this, many people who come for a free bike will still simply take the bike and leave. Living in poverty is relentless stress that leaves little time to get involved in a bike program. But by respecting and valuing everyone who comes to the program, you will find that some will take you up on your offer. Even those who walk or ride away will benefit from being treated with respect and some will return to take part when their schedules allow. If you have a bike charity or are giving away bikes through your program, at least look at making this change. Invite everyone who comes in for a bike to take part in your program, even in the smallest way, perhaps just through offering ideas. Better yet, stop giving bikes away! Put a proper price on every bike and part you provide. Make that price similar to bike shops in your area and ensure that each sale will not only cover your cost of that bike or part, but the overhead it took to sell it. Ask for donations and grants to help subsidize purchases by people who can prove to you that they truly cannot pay full price. By putting price tags on your bikes and parts, not only are you showing their true value, you will be showing respect to everyone who comes to your program. They are simply fellow humans looking for a bike. Your equal. Your subsidy program can help them make the purchase, but in the end they will be buying a bike just like anyone else. Our book, Defying Poverty with Bicycles, covers the details for setting up a successful subsidy program. I realize this is a controversial topic, especially for anyone who has spent a lot of time and energy giving away bikes. I’d love to hear your thoughts and criticisms. I’d also love to see comments from anyone who has made a smooth transition from a bike charity to a more egalitarian program that engages even the most impoverished people. Even more exciting would be to hear from bike programs that have engaged bike recipients in leadership positions for their program.